The following implementation is only valid for just one multiple products field, it will NOT work with 2 or more. If you have already installed and enabled the Payment Package, please skip this step. Downloads >> My Downloads >> RSForm!Pro >> click on view all plugins and modules >> RSForm!Pro Files >> Plugins >> Payment Package (Payment Plugin + PayPal + Offline) for Joomla! 3.x. Installing the plugin is done in the same manner as with any other Joomla! extension, through the Extensions >> Extension Manager feature. Please note that, although we have named the field products, you can name it in any way you like, just remember to adjust its name in the code that will be provided below as well, otherwise this example will not work. This applies for all other fields. The values found to the left of the pipeline character ( | ) represent the products' prices, whereas the values found to the right side (T-Shirt, Pants and Shoes) represent the products' captions that will be displayed in the frontend. A dropdown named quantity containing items from 1 to 5, each on a separate line. Instead of values from 1 to 5 you can use any quantities your particular scenario requires. You might want to place the field to the left or right side of the multiple product field. To do so, you will need to manually adjust the form's layout. A default PayPal integration Choose Payment field. Please note that it is mandatory for this field to be present in any PayPal form. 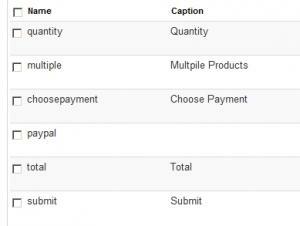 The (Payment) PayPal field, also mandatory for the form to redirect to PayPal when submitted. 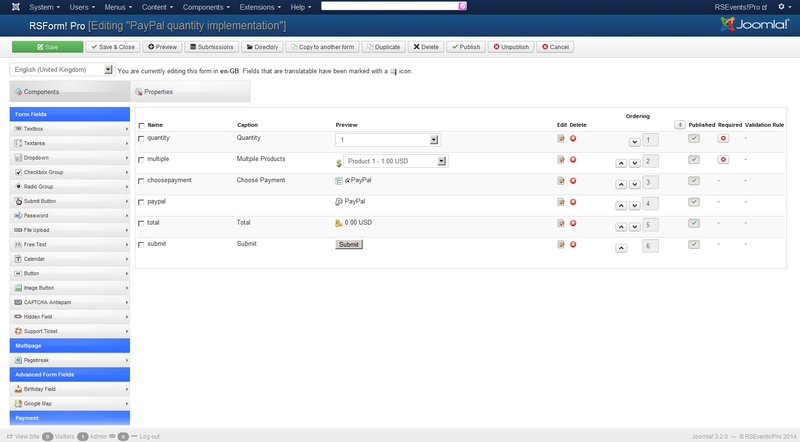 The default PayPal integration Total field - mandatory. A Submit Button. Make sure you don't confuse it with the regular Button, otherwise the form won't get submitted. Notice the getPrice_x() function and the payment_total_x form field ID. Please replace x with your form's ID.